Proudly continuing to “enable the global mobile ecosystem” the company has announced Yahoo! onePlace which is, apparently, a revolutionary mobile content management solution. And we like solutions. Oh yes indeedy. Modestly reflecting on their achievements in “reinventing mobile search and mobile communications”, Yahoo! say that onePlace is designed to lump together a user’s interests and information into a personalised web service, accessible from across the web via PCs and mobile devices. 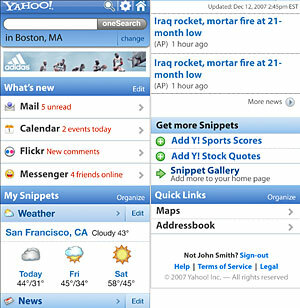 Content is “instantly organised, dynamically kept current, and served to [users] the way they want” with Yahoo insisting that the content will be customised, nay hyper-customised to reflect a user’s preferences and tastes, with the service aggregating and filtering content into mobile sized chunks. There’s also a “pulse” view, which intelligently sorts the content order: e.g. an upcoming flight would stay at the top of the screen until the plane’s taken off, and upon arrival at the destination the content would be shuffled about to present localised information. “Yahoo! onePlace is where users will be able to find what matters to them the most, no matter where their interests, passions and information come from. Yahoo! onePlace will provide mobile users with a rich and dynamic content experience,” he table-thumped with vim and gusto and anything else he could get his hands on. With open APIs already unleashed into the wild, Yahoo! are hoping that content providers will embrace onePlace like a hot date. Yahoo! have promised that the service will be equipped with a big cache to let users store content and view it locally without having to constantly connect to the web. The service is expected to be funded by the usual wodge of pesky adverts all over the t’shop with partner revenue sharing deals also a possibility. Yahoo! onePlace is expected to launch, along with Yahoo! oneConnect, in Q2 2008.